A regular breeding resident and migrant throughout the state. Occasionally present in the winter months, primarily in central and southern regions of the state. The Eastern Bluebird was a common species during the Minnesota Breeding Bird Atlas (MNBBA). Largely restricted to eastern North America, in the United States the Eastern Bluebird is found from the Dakotas south to central Texas and east to the Atlantic coast. In Canada it is found from southern Manitoba east to Nova Scotia. Populations are also found in Central America. In the northern portion of its range, it is only a summer resident, but elsewhere it is a year-round resident. Within North America, populations reach their highest densities in the southern states from eastern Kansas, Oklahoma, and Texas east to Virginia, the Carolinas, and Georgia (Figure 1). Considered on the brink of extinction in the mid-20th century, the Eastern Bluebird population has steadily increased due in part to citizen-led conservation efforts; it is now assigned a Continental Concern Score of 7/20 by Partners in Flight. A partial, short-distance migrant in the northern regions of its breeding range. Most birds winter in the southern United States. Migratory movements are one of the few aspects of this well-studied bird that have not received attention. Arthropods and berries secured on the ground or in shrubs and trees; also known to hover above prey items and catch them in midair. Secondary cavity nester that uses natural cavities in trees, old woodpecker cavities, and nest boxes. Breeding distribution and relative abundance of the Eastern Bluebird in North America based on the federal Breeding Bird Survey, 2011 to 2015 (Sauer et al. 2017). Roberts (1932) described the Eastern Bluebird in Minnesota as a “common summer resident throughout the state.” Although he considered it to be most abundant in the “well-settled” areas of the state, it was “not at all uncommon as a summer resident in the desolate, burned-over areas and windfalls of the northern forests.” It was even known to occasionally winter as far north as Duluth. Extremely cold weather during the winter of 1895 was evidence of the species’ vulnerability to cold temperatures. Roberts reported that the species was virtually “exterminated” from southern Minnesota that year. Nearly 12 to 15 years passed before it returned to its former level of abundance. Breeding evidence (i.e., nests and nests with eggs and/or young) was confirmed in 9 counties: Carlton, Cass, Goodhue, Hennepin, Houston, Isanti, McLeod, Polk, and Stearns. Apart from the dramatic decline in abundance observed after the winter of 1895, there is no hint in Roberts’s account of the crisis that lay ahead. The Eastern Bluebird is well known for the population decline it experienced in the early to mid-1900s followed by a rather extraordinary recovery. Quite simply, the bluebird faced what many biologists referred to as a housing shortage. An inhabitant of open woodlands and a cavity nester, the species does not excavate its own cavities but depends on the availability of natural cavities in trees or old wooden fence posts or on previously excavated woodpecker cavities. Some of the bird’s favorite haunts in the late 1800s and early 1900s were orchards, where the dead and dying limbs of old apple trees provided an abundance of natural crevices and cavities. What unfolded in the early 20th century was a tsunami of events that led to the bluebirds near demise. First, orchards became more intensively managed as a cash crop. Dead and dying limbs were pruned, while potential nesting cavities on live limbs were filled and painted with creosote to prevent further damage by insects and cavity-nesting species. Farming practices also changed. Dead trees were cut down, old wooden fence lines were replaced with new metal posts and wire, and old shelterbelts and vegetated field borders were demolished to increase cropland acreage (Lindquist 1952; Kraske 1981; Smith 2016). As detrimental as these management practices were to bluebirds, an even bigger culprit was the introduction of two species in New York City in the mid- to late-1800s: the House Sparrow and the European Starling. Their rapid spread across North America, often aided by additional local introductions, is well documented and posed a significant threat to bluebird populations. Aggressive species, both the House Sparrow and Starling nest in cavities and can quite successfully outcompete Eastern Bluebirds for available sites. Although these factors are frequently cited as the principal factors responsible for the species’ decline, the impacts of climate should not be overlooked. One of the earliest songbirds to return each spring, bluebirds are notoriously vulnerable to the vagaries of spring weather. The impact of late snowstorms, freezing rain, and cold temperatures on local and regional populations are well documented (Sauer and Droege 1990). It was likely a combination of all these factors that led to the observation by many that Eastern Bluebird populations were declining. Although there were little quantitative data, anecdotal accounts of declines abounded. State and federal biologists took note. The National Audubon Society established its Blue List in 1971, designed as an early warning system to identify species that were experiencing serious losses. The Eastern Bluebird was on the list in 1972 and from 1978 to 1982 (Tate 1986). Several states also added the bluebird to their state list of rare, endangered, or special concern species in the late 1970s (Smith 2016). Because it was such a beloved species, citizens and biologists alike banded together to ensure that the bluebird had a bright future. The man credited for the first call to action was T. E. Musselman, a biologist who took particular note of the local decline in bluebirds in Illinois and launched his own investigation into the proper construction of bluebird next boxes that would be suitable for the birds. Once he found a design that worked, he established his own small bluebird trail. He published his findings in several ornithological journals, where he appealed to others to initiate similar efforts. In little time, local bird clubs, schools and organizations were responding to the call, and thousands of bluebird trails were constructed and maintained throughout eastern North America. In Minnesota, Willis Lindquist immediately responded to the call for action and wrote an extensive article in the state ornithological journal, The Flicker (now The Loon), about Musselman’s work (Lindquist 1952). That same year the Duluth Bird Club published a “note of interest” in The Flicker (Bronoel 1952) detailing their work to build and place 65 bluebird houses on Minnesota Point and along roads north of Duluth. They were the first of many local bird clubs to initiate such efforts and were soon followed by the Albert Lea Audubon Society in 1957 (Flugum 1957) and the Hiawatha Valley Bird Club in 1965 (Dahm 1966). Several individuals also reported on their personal initiatives to establish nest boxes and trails in Dodge, Itasca, and Wabasha Counties (Strand 1959; Mahle 1962; Blomgren 1963). Efforts further expanded when in 1979 the Minneapolis chapter of the National Audubon Society took the lead in establishing the Bluebird Recovery Program. Two years later, in 1981, the Nongame Wildlife Program of the Minnesota Department of Natural Resources also designated funds for bluebird restoration and education (Peterson 1983). When Green and Janssen (1975) published their updated account of the species’ status in Minnesota, they described it as a summer resident throughout the state but noted its absence from the northern forest region and its scarcity in the western agricultural region. Just 12 years later, Janssen (1987) provided another update and documented bluebird nesting in every region of the state, from Jackson County in the southwest to Cook County in the northeast. Since 1970, nesting had been confirmed in 70 of Minnesota’s 87 counties. Janssen considered the species most abundant in central Minnesota. Specific mention was made of the advent of bluebird trails and the expanding statewide population. Hertzel and Janssen (1998) later added 5 more counties to the list of counties where nesting had been confirmed. Fieldwork conducted by the Minnesota Biological Survey further confirmed the species’ presence in all but the most intensively cultivated regions of the state (Minnesota Department of Natural Resources 2016). During the MNBBA, participants reported a total of 3,313 Eastern Bluebird records in 36.0% (1,722/4,783) of the surveyed atlas blocks and in 43.8% (1,023/2,337) of the priority blocks. Breeding evidence was documented in 796 blocks (Figures 2 and 3; Table 1). The birds were observed in all 87 Minnesota’s counties and were documented breeding in 76 counties (1 block straddled 2 counties); 7 counties were additions to Hertzel and Janssen’s earlier list. Ten of the 11 counties where they were not confirmed breeding were located in Minnesota’s agricultural region. Cook County was the only northern county where nesting was not reported. The species was most abundant and widely distributed throughout the Eastern Broadleaf Forest Province and the southern portion of the Laurentian Mixed Forest Province. The MNBBA predicted breeding distribution map (Figure 4) predicts moderate breeding densities throughout the central portion of the Eastern Broadleaf Forest Province and the southern and western portions of the Laurentian Mixed Forest Province. Father west, scattered pockets of moderate densities are found along the prairie-forest border in northwestern Minnesota, the upper Minnesota River valley, and the Tallgrass Aspen Parklands Province. Scattered pockets also are found in southeastern Minnesota. These regions are all characterized by a combination of open woodlands that provide ideal nesting habitat for Eastern Bluebirds and recreational homes where nest boxes are likely a common feature. Despite the heightened concern regarding the bluebirds’ declining population during the latter half of the 20th century, Gowaty and Plissner (2015) point out that even then the species may have been more common than at any earlier point in history. Until the eastern deciduous forest was cleared in the 1800s, suitable habitat for the species was likely limited. Nevertheless, today the Eastern Bluebird is thriving across its breeding range. Its ready acceptance of nest boxes has not only spurred its recovery but, because of the ease of monitoring nest boxes, has also led to its becoming one of the most intensively studied songbirds in North America. Breeding distribution of the Eastern Bluebird in Minnesota based on the Breeding Bird Atlas (2009 – 2013). Summary statistics of observations by breeding status category for the Eastern Bluebird in Minnesota based on all blocks (each 5 km x 5 km) surveyed during the Breeding Bird Atlas (2009-2013). Summary statistics for the Eastern Bluebird observations by breeding status category for all blocks and priority blocks (each 5 km x 5 km) surveyed during the Minnesota Breeding Bird Atlas (2009-2013). Predicted breeding distribution (pairs per 40 hectares) of the Eastern Bluebird in Minnesota based on habitat, landscape context, and climate data gathered during the Minnesota Breeding Bird Atlas (2009-2013) using the General Linear Modeling method with an adjustment for detectability. The most characteristic features of the Eastern Bluebird’s habitat are an open landscape with scattered trees, little to no understory, and sparse ground cover. Stands need to be old enough to provide sufficient snags and/or dead and dying limbs. Historically, before agriculture and development opened wide expanses of the eastern deciduous forest, the bluebird likely occupied scattered forest openings with residual trees, fire-maintained oak and pine savannas, beaver ponds, and open stands of pines (Gowaty and Plissner 2015). Today the species occurs in a wide variety of open habitats with scattered trees, including farmsteads, orchards, old fields, oak savannas, open jack pine woodlands, forest edges, and forest clearings (Figure 5). Its ready acceptance of nest boxes has broadened the range of habitats it uses even further to include large suburban lots, golf courses, and parks. In northern Minnesota the species continues to be found in forest clearings with scattered trees and snags left behind by logging and fire. The National Forest Bird (NFB) Monitoring Program in northern Minnesota and Wisconsin found a very clear association of Eastern Bluebirds with open, upland sites that were recently harvested (Niemi et al. 2016). Habitat data collected within 200 m of MNBBA point counts where bluebirds were detected showed the strongest association was with grasslands and oak forests (Figure 6). Typical breeding habitat of the Eastern Bluebird in Minnesota (© Gerald J. Niemi). Habitat profile for the Eastern Bluebird based on habitats within 200 m of point counts where the species was present during the Minnesota Breeding Bird Atlas (2009-2013). Data collected by the federal Breeding Bird Survey (BBS) have been used to generate a North American population estimate of 20 million breeding adults (Rosenberg et al. 2016). The statewide estimate for Minnesota was 300,000 birds in 2013 (Partners in Flight Science Committee 2013). MNBBA data were used to test the BBS-derived estimates and generated a statewide estimate more than twice as high, at 641,000 breeding adults (95% confidence interval of 502,000 to 827,000 adults). Although they are a common species in Minnesota, Eastern Bluebirds reach much greater breeding densities in the southern United States (Figure 1). In Minnesota an average of 1 to 2 Eastern Bluebirds are detected on BBS routes each year. In the Central Hardwoods region, which runs across the center of the eastern deciduous forest, the average number of bluebirds on BBS routes is 16 to 17 (Sauer et al. 2017). Since the BBS began in the mid-1960s, Eastern Bluebird populations have demonstrated a strong, statistically significant population increase throughout their breeding range, increasing an average of 1.50% per year. The rate of increase has slowed since 2005, with BBS data depicting a more stable trend line (Sauer et al. 2017). The annual rate of increase has been higher in Minnesota, with an average annual increase of 2.93% per year since 1967, declining to an average of 0.56% since 2005 (Figure 7). When one examines the pattern of increases and decreases across the species’ range, it is notable that one pocket of decline occurs across the Great Lakes forest region of the United States from northern Minnesota across northern Wisconsin and Michigan (Figure 8). This may reflect a decline in harvest levels on national forests corresponding with an increase in forest age; these landscape-level changes are well documented in Minnesota (Minnesota Forest Resources Council 2014; Niemi et al. 2016). The NFB Monitoring Program on the Superior and Chippewa National Forests, however, found that the bluebird was not common enough to detect a population trend (Bednar et al. 2016; Niemi et al. 2016). Other factors that influence local and regional numbers of bluebirds include nest site availability, winter food abundance, competition with other secondary cavity–nesting species, and weather (Gowaty and Plissner 2015). 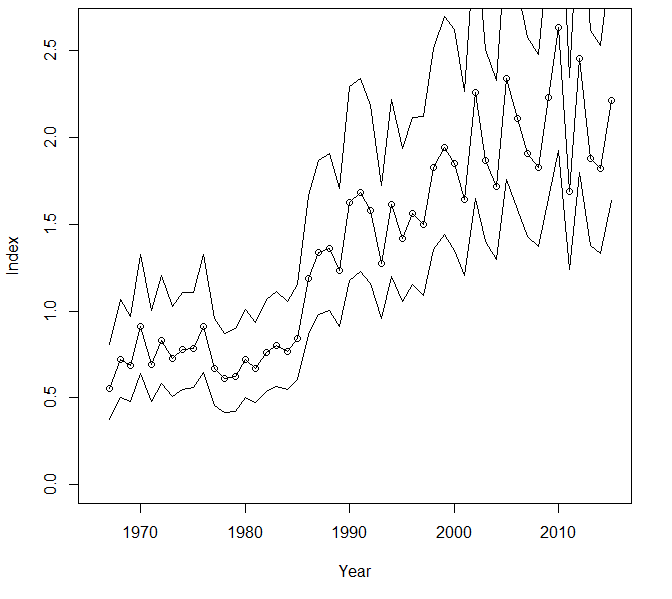 Breeding population trend for the Eastern Bluebird in Minnesota for 1967–2015 based on the federal Breeding Bird Survey (Sauer et al. 2017). Population trend map for the Eastern Bluebird in North America for 1966–2015 based on the federal Breeding Bird Survey (Sauer et al. 2017). Although the Eastern Bluebird was a listed species in many states 30 to 40 years ago, its steadily increasing population since the 1960s is a testament to its improved status and reduced conservation concern. Partners in Flight has assigned it a relatively low Continental Concern Score of 7/20 (Rosenberg et al. 2016). Even a warming climate, which is a concern for many North American birds, is predicted to have little impact on this beloved member of the state’s avifauna (North American Bird Conservation Initiative 2010). Citizens devoted to the species’ conservation certainly deserve credit for their contributions to its recovery. Blomgren, Everett C. 1963. “Bluebird Reflections.” Flicker 35: 104–105. Bronoel, Joel K. 1952. “Duluth Bluebird Trail-1952.” Flicker 24: 158–159. Dahm, Grace. 1966. “Bluebird Trail, Winona.” Loon 38: 39. Flugum, Charles. 1957. “Experiences with Bluebird Housing.” Flicker 29: 69–71. Kraske, Robert. 1981. “Whatever Happened to Bluebirds?” Minnesota Volunteer (Jan/Feb): 42–48. Mahle, Donald G. 1962. “Bluebird Nesting.” Flicker 34: 132. Peterson, Ron. 1983. “A New Nesting Structure for Bluebirds.” Minnesota Volunteer (March/April): 54–56. Sauer, John R., and Sam Droege. 1990. “Recent Population Trends of the Eastern Bluebird.” Wilson Bulletin 102: 239–252. Strand, Forest V. 1959. “Suburban Housing Project Booms – Bluebirds Utilize New Homes.” Flicker 31: 33–34. Tate, James, Jr. 1986. “The Blue List for 1986.” American Birds 40: 227–236.